by Wendy Leebov, Ed.D. & Carla Rotering, M.D. Please select the quantity of books you’d like to purchase below. 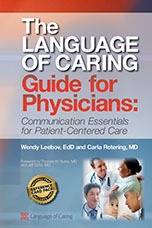 Concrete “how-to” guide to exceptional physician-patient communication by nationally recognized experts on healthcare communication. To thrive in this challenging environment, effective communication —with patients and families, other physicians, students, and coworkers is, on your part, pivotal. The quality of your communication – the important spoken and unspoken conversations that reside between you, patients and families, and coworkers – has a far-reaching impact on outcomes, public perception, reputation, pay, job satisfaction and much more. Spiral bound. Read this Patient Experience Journal book review by Chet Wyman, MD; Johns Hopkins Bayview Medical Center, Johns Hopkins Medicine.